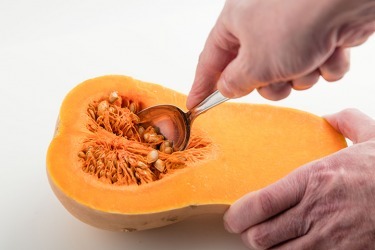 You should scoop the pulp out of a butternut squash before baking. The definition of pulp is relating to a book or magazine printed on cheap paper. An example of something pulp is a tabloid; a pulp newspaper. Pulp is the soft part of a fruit, or another soft mass. An example of pulp are the soft chunks found in orange juice. Pulp is defined as to remove the soft mass, particularly from inside a fruit, plant or tooth. An example of pulp is to take the insides out of an orange. "pulp." YourDictionary, n.d. Web. 09 April 2019. <https://www.yourdictionary.com/Pulp>. the soft, sensitive tissue in the center of a tooth, including blood vessels, nerves, etc. a magazine printed on rough, inferior paper stock made from wood pulp and traditionally characterized by sensational stories of love, crime, etc. A soft moist shapeless mass of matter. A mixture of cellulose material, such as wood, paper, and rags, ground up and moistened to make paper. A mixture of crushed ore and water. To remove the pulp from (coffee berries). A soft, moist, shapeless mass or matter. A mixture of wood, cellulose and/or rags and water ground up to make paper. Mass of chemically processed wood fibres (cellulose). To beat to a pulp. Varieties occur with yellow and reddish pulp; and there are also pear-shaped varieties. High and bears large pear-shaped fruits, green or deep purple in colour, with a firm yellowish-green marrow-like pulp surrounding a large seed. The pulp is much esteemed in the West Indies and is eaten as a salad, usually with the addition of pepper, salt and vinegar. Carnegie library, a hospital and manufactories of pulp, paper, lumber and woodenware. Long, good water-power is provided, and the city manufactures cotton goods, boots and shoes, paper, pulp and lumber.